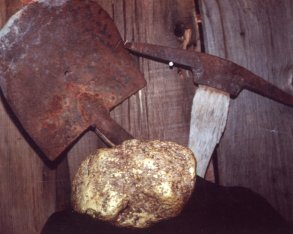 This page has photos of some of the largest gold nuggets ever found in Alaska. Many larger nuggets found in the early days were simply melted down, and so no photos exist of them. The number indicates the rough ranking of the nugget of those known to have been found in Alaska. To the best of our knowledge the Top 20 is the most accurate list of large nuggets found in Alaska. However, it is likely that we have missed some historical nuggets. If you know of any changes or additions that should be made to this page please notify the webmaster@akmining.com. 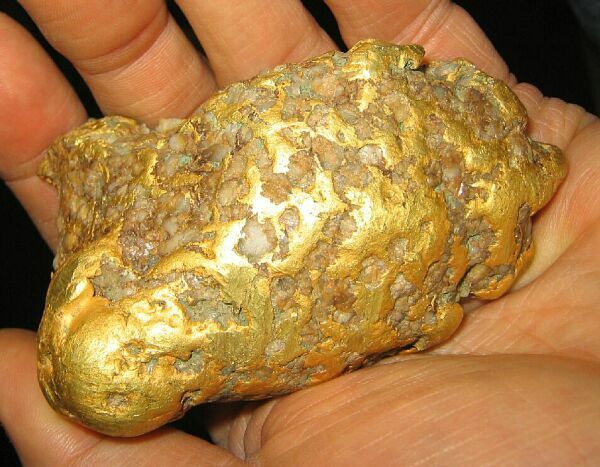 The largest gold nugget ever found in Alaska. It was found near Ruby, Alaska in 1998 by miner Barry Clay as he operated his bulldozer. The nugget rolled off the pile of dirt ahead of the bulldozer blade. This nugget was sold and the current location is unknown. Photo Copyright 2001 by Marshall Ronne, Jr. 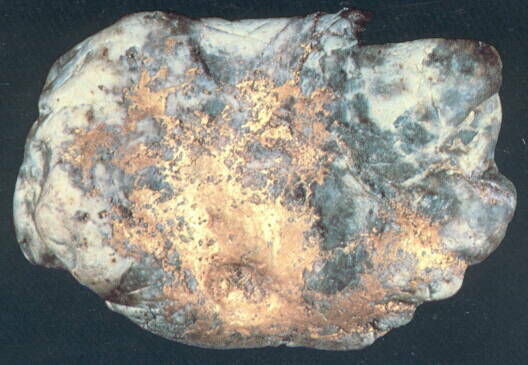 This nugget was found on Anvil Creek near Nome, Alaska in 1903 by the Pioneer Mining Company. 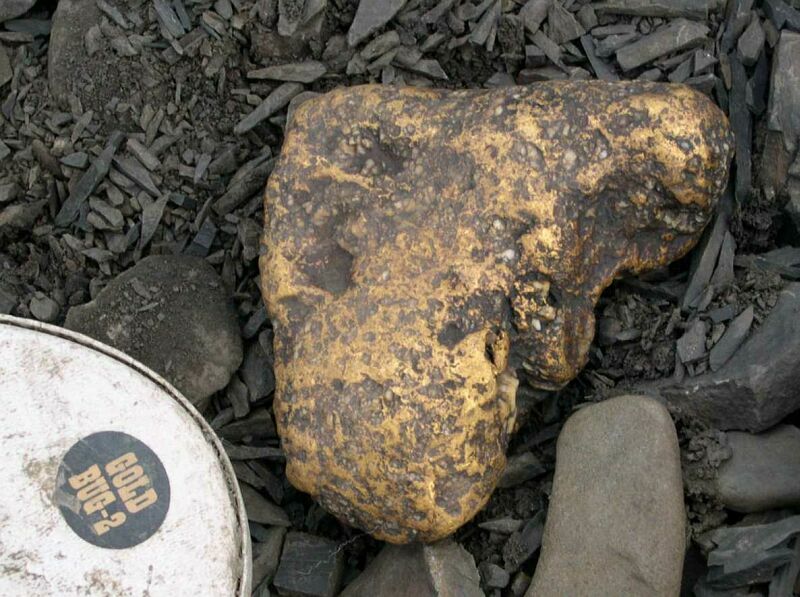 For almost 100 years it stood as the largest nugget found in Alaska, until the nugget above was found in 1998. The status of this nugget is unknown. Found on the Hammond River near Wiseman, Alaska. The status of this nugget is unknown. Found on Ganes Creek near McGrath, Alaska in 1985 by Warren Magnuson's son Lloyd Magnuson while commercial mining. This nugget is now owned by the Wiltz family. Found on Anvil Creek near Nome, Alaska. The status of this nugget is unknown. Found on Glacier Creek near Kantishna, Alaska in August 1984 by Mic Martinek. This nugget is still owned by Mr. Martinek and resides in a bank vault. Found on Fairbanks Creek near Tolovana, Alaska. The status of this nugget is unknown. Found on Dome Creek near Tolovana, Alaska. The status of this nugget is unknown. 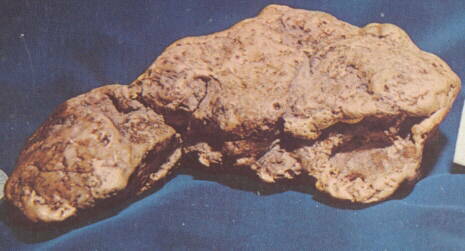 According to Dollie Magnuson Nelson, daughter of Warren Magnuson, this nugget was found on Ganes Creek near McGrath, Alaska in 1985 by Warren Magnuson and his son Ben. 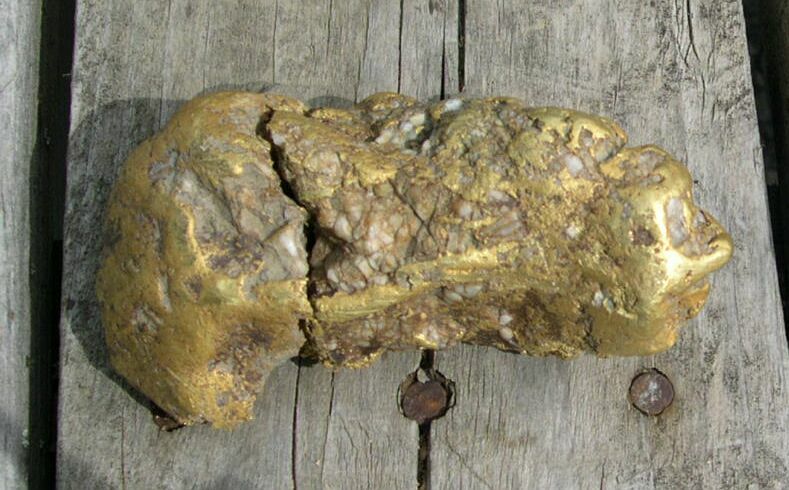 The nugget was found while mining on a bench deposit. 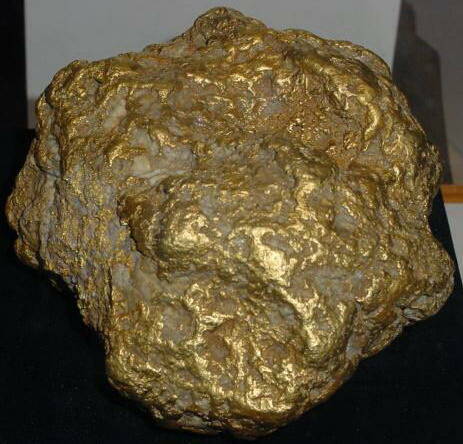 It's name is "Prospectors Dream" and that season, the nugget and 1 troy ounce of gold was all that was found. Dollie believes the Smithsonian owns it now. 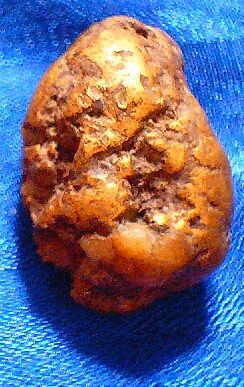 It was found in the same area as - #5 The Ganes Nugget. Found on Wade Creek near Chicken, Alaska in August 1983 by the Jack Wade Gold Company. This nugget is still owned by the Jack Wade Gold Company. Found on Lucky Gulch, a tributary of Valdez Creek, near Denali, Alaska. The status of this nugget is unknown. Found on Long Creek near Ruby, Alaska. 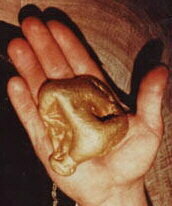 This nearly solid gold nugget is currently on display in the Wells Fargo Bank at Helena, Montana. 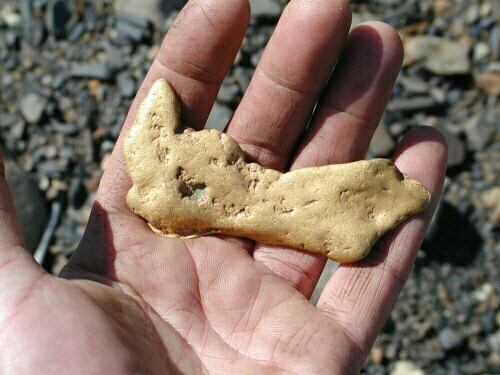 Found on Mary's Bench (Nolan Creek) near Wiseman, Alaska in 1994 by Silverado Gold Mines Ltd. 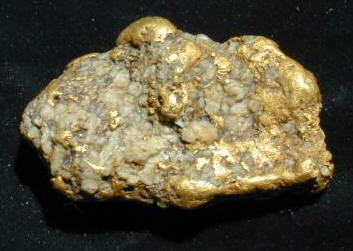 This nugget was sold to a collector in 2000 for $50,000.00, according to Garry Anselmo, head of Silverado Gold Mines Ltd. The nugget is now in Spain. 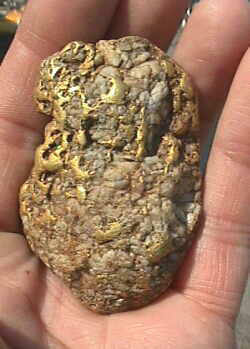 To see what kind of place produces large nuggets in Alaska see the Ganes Creek Gold page. This is a list of nuggets found in Alaska by people not engaged in commercial gold mining. 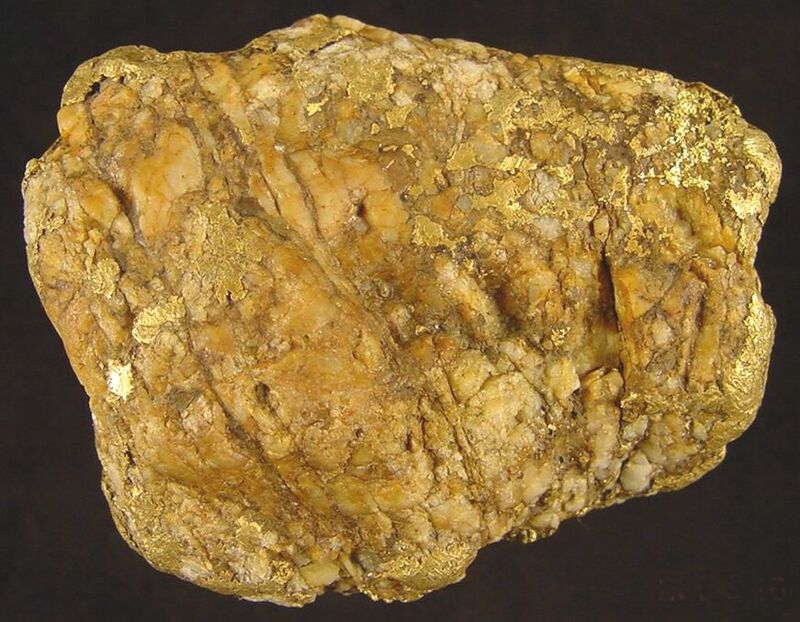 If you have found or know of a nugget over 1 ounce found by an individual in Alaska not engaged in commercial mining, please let us know at webmaster@akmining.com. We'd like to add them to our list. Found June 16, 2004 at Ganes Creek near McGrath, Alaska by Steve Burris of Idaho with a Fisher Gold Bug 2. 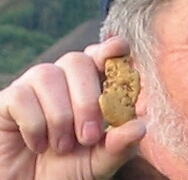 The nugget was found in an area where many others had detected, but all the previous detectorists had missed the nugget. 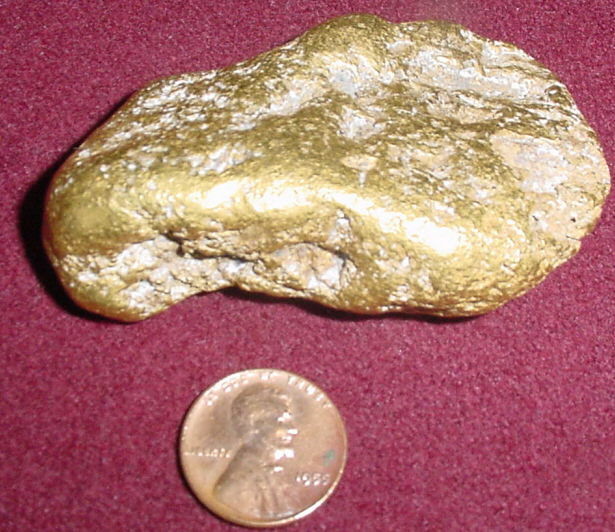 This may be the largest gold nugget ever found in Alaska by a non-commercial operator. If anyone knows otherwise, please let us know. 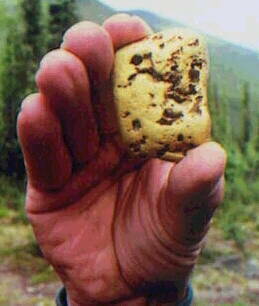 "The NAC Nugget" Found by Dave Rankin at Ganes Creek near McGrath, Alaska in 2004 with a White's MXT metal detector. The nugget was found at the end of the runway immediately after some bulldozer work was done to lengthen the runway. This work was demanded by Northern Air Cargo (NAC) to accommodate a landing by one of their cargo planes, so Dave credits them with being a reason the nugget was found. Dave's nugget had a fresh break on one end. 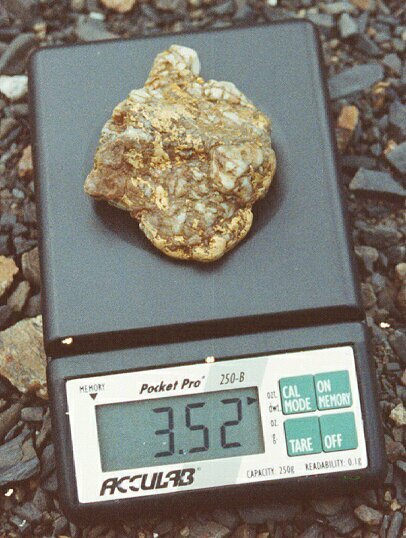 A few weeks after Dave found the nugget, Gary Cox located the other piece weighing just over 8 ounces. The nugget was unfortunately broken when the bulldozer ran over it. The total weight before it was broken was over 28 ounces. Found by Gale Herbertson at Paradise Valley in 2000 with a Minelab Explorer XS metal detector. Found on Granite Creek near McGrath with a metal detector. This nugget is currently owned by Scott Long of Omaha, Nebraska. 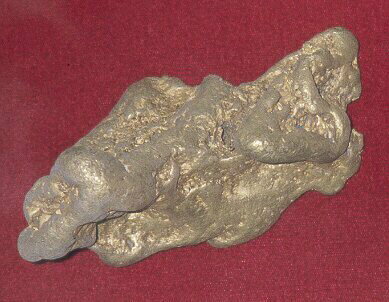 "The Goldfinger Nugget" Found by Bob Estey at Ganes Creek near McGrath, Alaska in 2002 with a White's V/SAT metal detector. 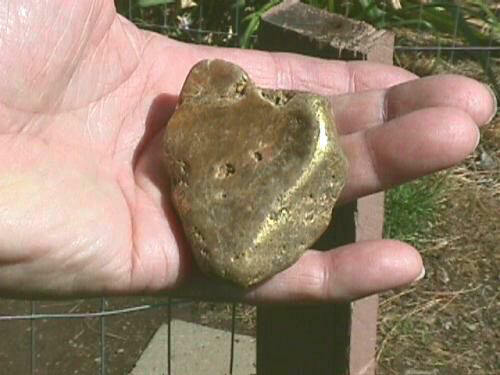 Bob found this nugget the same day he found the 5.62 ounce "Heartthrob" nugget below! Found by Dave Rankin at Ganes Creek near McGrath, Alaska in 2002 with a Fisher Gold Bug 2 metal detector. Dave went days without finding any gold, and then located this nugget. Found by Bert Rattner of New York at Paradise Valley in the 1991. Bert saw the nugget resting on a rock in the water, the verified it was gold with his Fisher 1266-X. 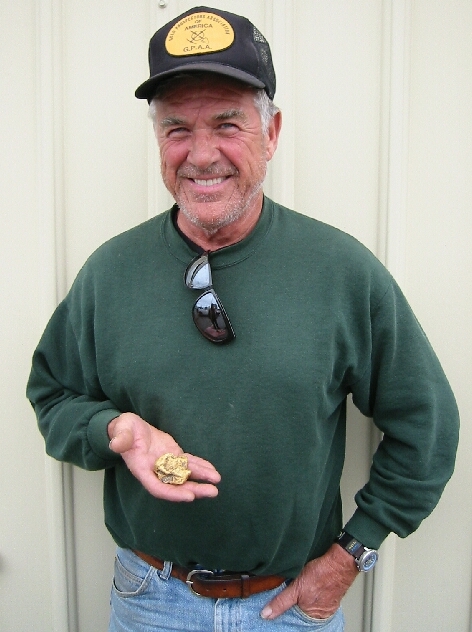 Found by Gordie Landberg of Spokane Valley, WA at Ganes Creek near McGrath, Alaska in June 2003 with a Fisher Gold Bug 2 metal detector at a depth of 15 inches. Found by Otis Rood of Minnesota at Paradise Valley in the 1985 with a Garrett A.D.S. metal detector. Found by Bill Dunlevy in a stream on the Kenai Peninsula, Alaska in the 1995 with a 5" suction dredge. Found by George White at Moore Creek near McGrath, Alaska in 2004 with a Minelab GP 3000 metal detector. 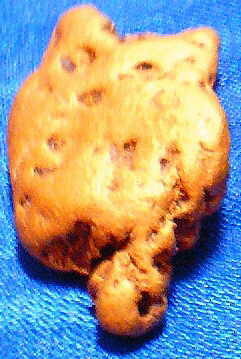 This nugget was found in a small berm of material pushed up by a bulldozer. 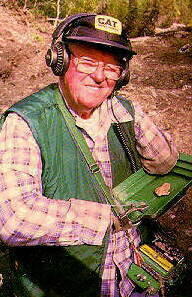 Found by Steve Houston at Ganes Creek near McGrath, Alaska in 2002 with a White's Goldmaster GMT metal detector. This nugget was found in material excavated to create a drainage ditch. Found by Tim Haller at Ganes Creek near McGrath, Alaska in 2002 with a Minelab SD2100 metal detector. Tim found this beauty just a couple hours before his week-long trip to Ganes Creek ended. Found by John Pulling at Ganes Creek near McGrath, Alaska in 2002 with a Fisher Gold Bug 2 metal detector. 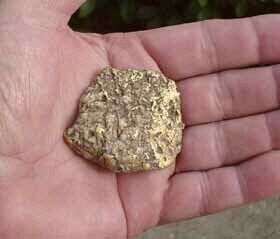 This nugget was found in old bucketline cobble rows. John searched near a pile of old cans others had passed by not wanting to dig junk and came up with this nugget. 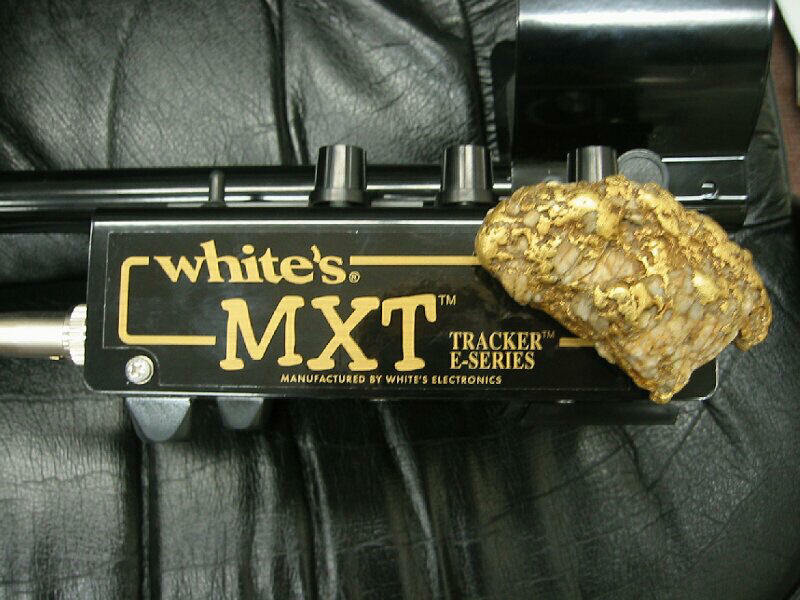 Found by Dennis Lundine at Ganes Creek near McGrath, Alaska in 2004 with a White's MXT metal detector with stock 950 coil. 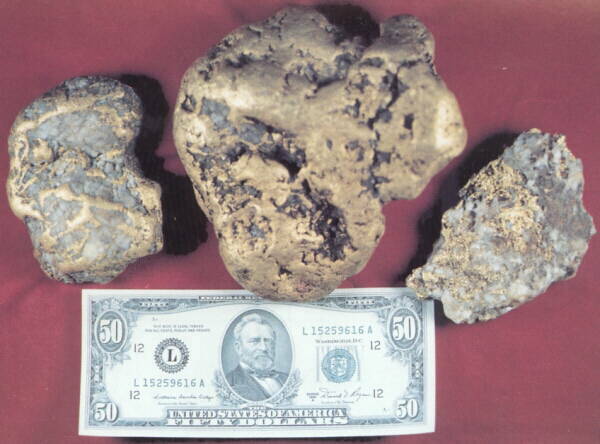 Found by Steve Herschbach at Ganes Creek near McGrath, Alaska in 2002 with a White's Goldmaster GMT metal detector. 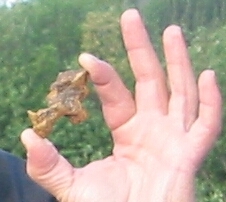 This nugget was found right in the main camp at Ganes Creek in material excavated while digging a ditch. Found by Ed Hill at Paradise Valley in 1999 with a Garrett Gold Stinger metal detector. 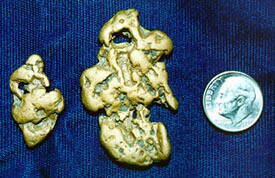 Found by Fred Brust at Ganes Creek near McGrath, Alaska in 2002 with a Fisher Gold Strike metal detector. 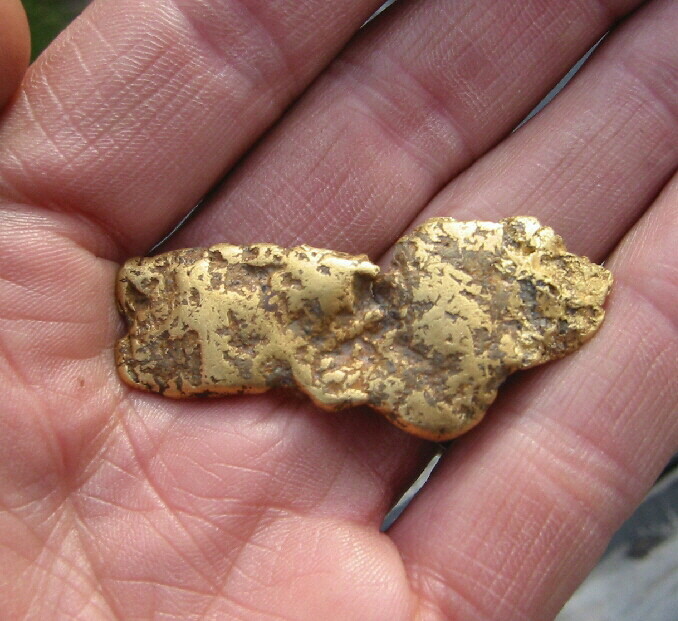 Found by George White in the Innoko Mining District with a Minelab XT17000 metal detector. Found by George White in the Fortymile Mining District in 2001 with a Minelab XT17000 metal detector. 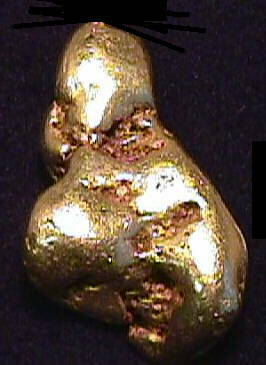 "The Bulldog Nugget" Found by Steve Herschbach at Ganes Creek near McGrath, Alaska in 2002 with a Fisher Gold Bug 2 metal detector. Steve has three English Bulldogs, and this nugget reminded him of them. Found by Steve Herschbach at Crow Creek in 1998 with a Keene 6" gold dredge. Gold most commonly comes from quartz veins. Quartz is a very common, glass-like mineral, and gold is often deposited as chunks and specks enclosed within the quartz. As the quartz is crushed or decomposed by erosion processes, the gold is released to become the nuggets and flakes of gold found by miners. Sometimes large pieces of these quartz veins are found with gold still enclosed... a future nugget waiting to be released! These are not gold nuggets but are usually referred to as gold/quartz specimens. There is no official definition but our unofficial definition is that the item in question has to look like it is mostly gold by a pretty good margin. 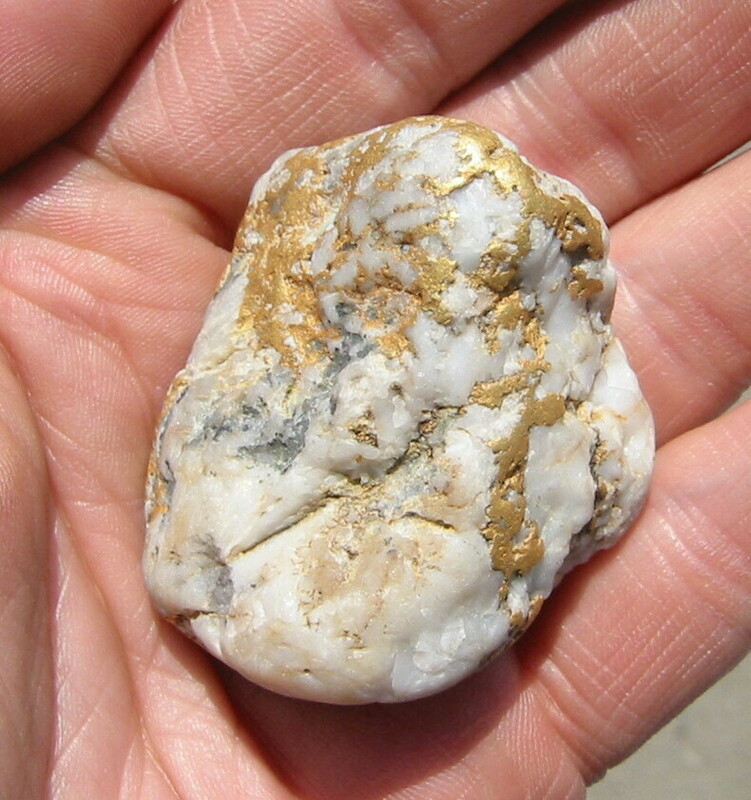 At least 75% of the exposed surface should be gold, not rock. In other words, is it a rock with gold in it, or gold with rock in it? 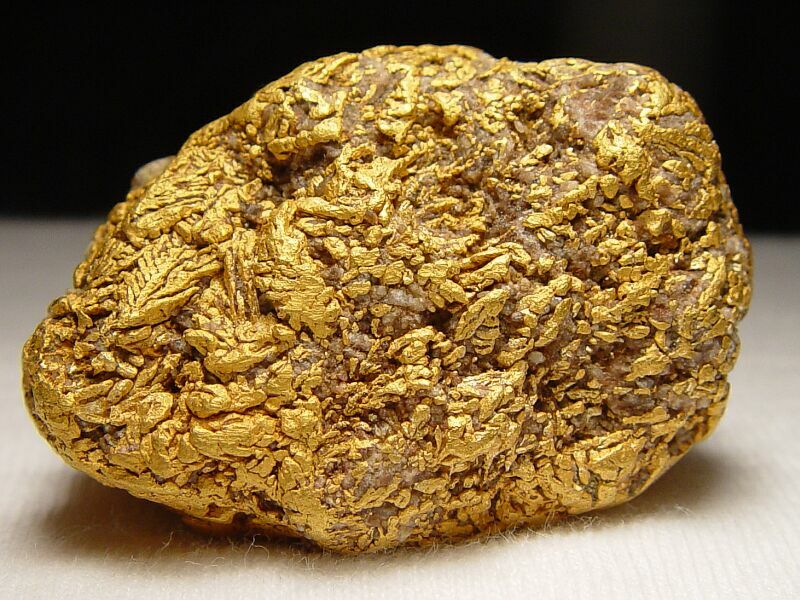 These specimens are actually rarer than gold nuggets, and prized by collectors as they illustrate so well an answer to that commonly asked question "where does gold come from"? 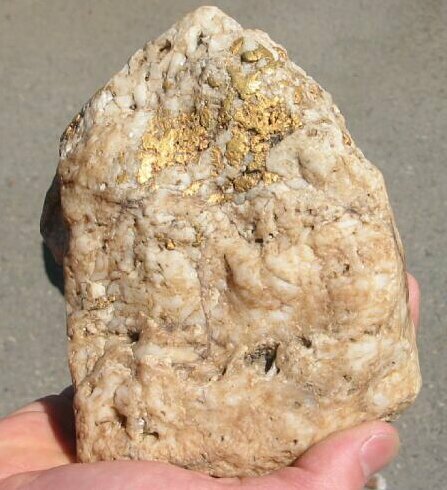 If you have found or know of a gold/quartz specimen over 1 ounce found in Alaska, please let us know at webmaster@akmining.com. We'd like to add it to our list. Found on Ganes Creek near McGrath, Alaska in 2004 by Terry Howard with a metal detector. Found on Ganes Creek near McGrath, Alaska in 1996 by Dan Wiltz with a metal detector in the mining pit prior to processing. This specimen is essentially a cross-section of an extremely rich gold vein, and assayed over 1600 ounces per ton. 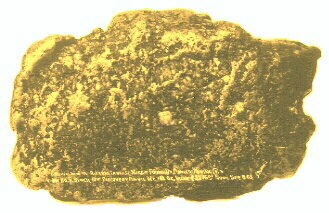 This specimen is still owned by Clark-Wiltz Mining. Found on Ganes Creek near McGrath, Alaska in 2003 by Mark Tisler with a metal detector. Found by Charlie ? on Bear Creek near Hope, Alaska in the 1980's with a 4" suction dredge. This nugget was displayed at Oxford Assaying & Refining but has been sold. If anyone can locate a picture of this nugget we would appreciate it. There was considerable quartz in the piece. 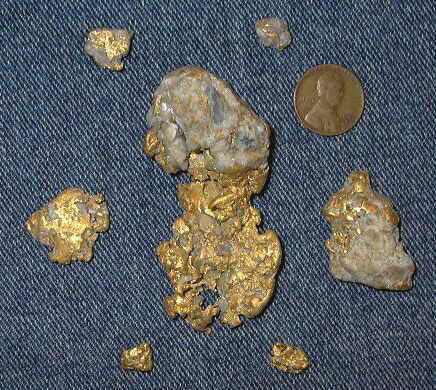 Found at Ganes Creek near McGrath, Alaska in 2004 by Duane (Dewy) Schmit with a metal detector. Found by Tom Kunkler at Ganes Creek near McGrath, Alaska in 2003 with a Tesoro Lobo Super Traq metal detector. Tom found the specimen on his first day at Ganes Creek. Found by Dave Rankin at Ganes Creek near McGrath, Alaska in 2003 with a White's MXT metal detector. Found by Steve Herschbach at Ganes Creek near McGrath, Alaska in 2002 with a White's MXT metal detector. The nugget was found in the old dredge cobble piles. It has a solid gold core surrounded by an unusual lustrous dark quartz. The quartz is intergrown with dendritic (leaf) gold. 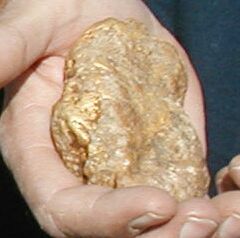 The nugget contains approximately 3.7 ounces of gold. Found by Gordie Landberg of Spokane Valley, Wash. at Ganes Creek near McGrath. Found in June 2004 with a Fisher Gold Bug 2 detector at a depth of about 10 inches. 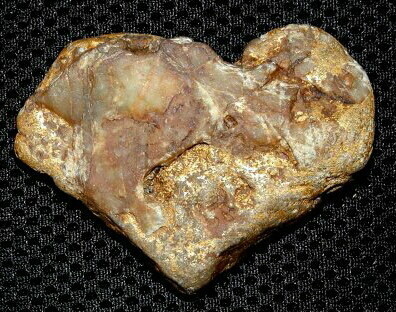 "The Heartthrob Nugget" Found by Bob Estey at Ganes Creek near McGrath, Alaska in 2002 with a White's V/SAT metal detector. Found by Bob Herschbach at Moore Creek near McGrath, Alaska in 2004 with a Minelab GP 3000 metal detector. 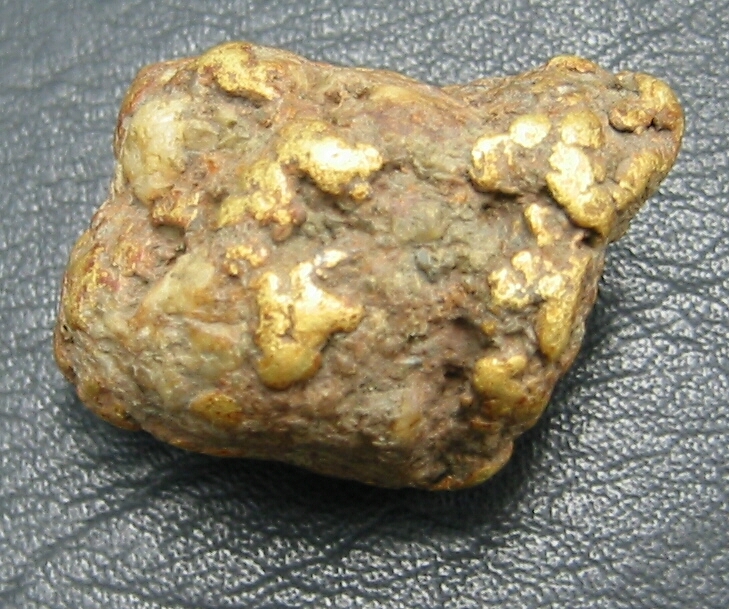 The nugget is a section of a very rich gold vein with heavy gold layers in the middle. 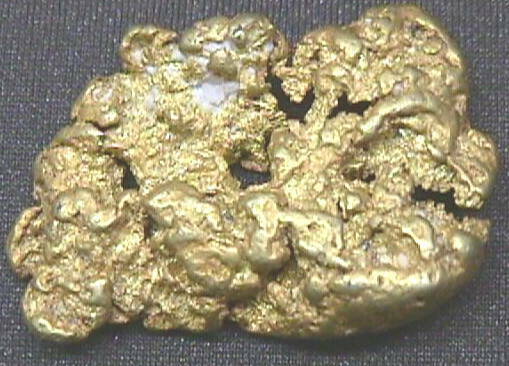 It contains approximately 2.19 ounces of gold. 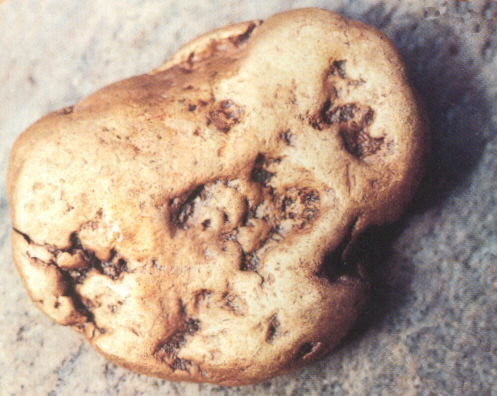 "The Potato Nugget" Found by Steve Herschbach at Ganes Creek near McGrath, Alaska in 2001 with a Fisher Gold Bug 2 metal detector. His first thought on digging it out of the dark soil was that it looked like a potato. Found by Bud Herschbach at Ganes Creek near McGrath, Alaska in 2001 with a Tesoro Lobo SuperTRAQ metal detector. This nugget was found in the airstrip surface. The airstrip is made of old mine tailings. Found by Steve Herschbach at Moore Creek near McGrath, Alaska in 2003 with a Minelab GP 3000 metal detector. 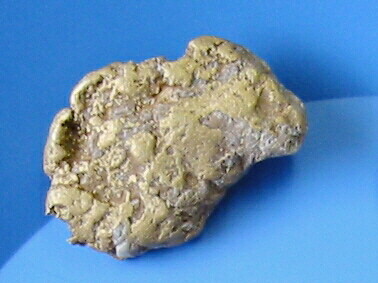 The nugget is a section of a very rich gold vein with a thick gold sandwiched in the middle. 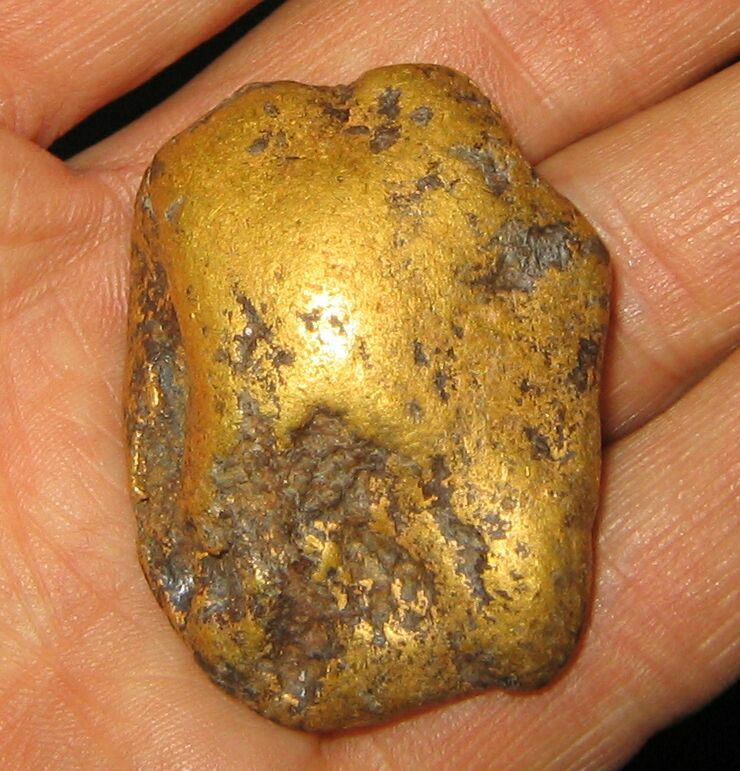 "The Cobble Nugget" Found by Steve Herschbach at Ganes Creek near McGrath, Alaska in 2002 with a Fisher Gold Bug 2 metal detector. It was found in the old bucketline dredge cobble piles. "The Meteorite Nugget" Found by Steve Herschbach at Moore Creek near McGrath, Alaska in 2003 with a Minelab GP 3000 metal detector. The dark pitted surface reminded Steve of meteorites he has seen. Found by Harold from Florida at Ganes Creek near McGrath, Alaska in 2002 with a Minelab XT18000 metal detector. Found by Steve Herschbach at Ganes Creek near McGrath, Alaska in 2002 with a Fisher Gold Bug 2 metal detector. This specimen was found in very thick brush at the base of a tailing pile. It features many large slugs of gold scattered evenly though the quartz. Currently owned by Clark-Wiltz Mining. Found by Jim Newby at Ganes Creek near McGrath, Alaska in 2002 with a Fisher Gold Bug 2 metal detector. This nugget was found right in the cobble piles near the old bucketline dredge. It was the very first item Jim found with his detector at Ganes Creek! Found by Tom Herschbach at Moore Creek near McGrath, Alaska in 2004 with a Minelab GP 3000 metal detector. These nuggets are fresh out of the ground and have just been washed off. The red staining is from the rich red soil they have been buried in. 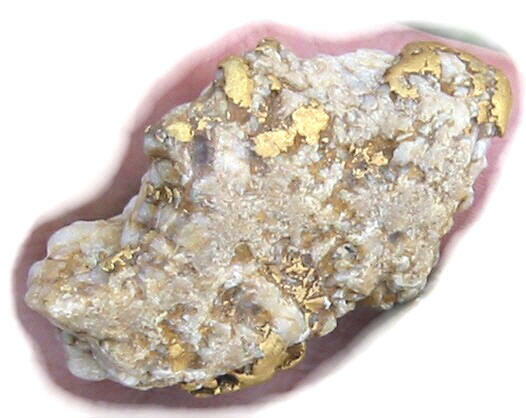 Alaska Gold Nuggets for Sale - Gold nuggets and gold specimens from Alaska. 1976 - 2005 AMDS celebrates 29 years of service!